Is Kingdom Hearts brilliant or incomprehensible? Hackneyed or joyful? Today on Kotaku Splitscreen, we decide that the answer is... all of the above! First we talk about the many games we’ve been playing, including Resident Evil 2, Wargroove, Bloodborne, and Destiny 2. Then we take a deep dive into Kingdom Hearts (34:01), debating whether the story is convoluted, analyzing why people love it so much, and dissecting the pros and cons of the brand new Kingdom Hearts III. Finally, off topic talk (1:06:45) on the Fyre Festival documentaries and Happy Endings. Maddy: I’m enjoying it. I’m also here for a lot of the Kingdom Hearts crap that I know you’re not here for. So to me it’s fun. 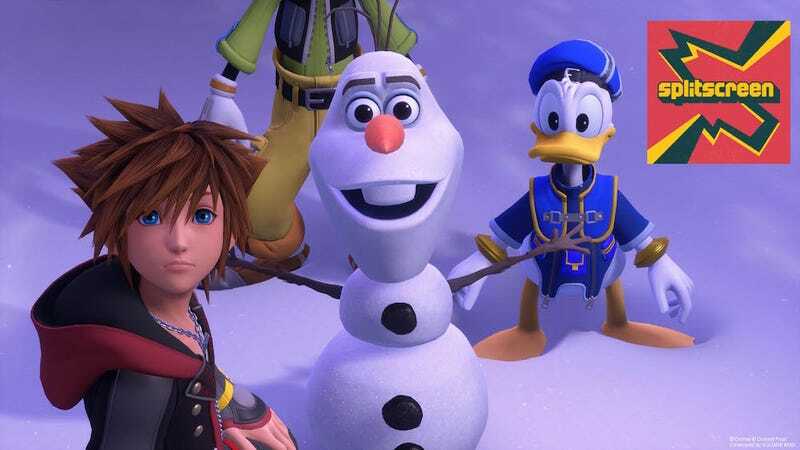 But I also recognize that the tone of Kingdom Hearts is incredibly strange, and to me it’s nostalgic to have Donald and Goofy and their son Sora, the three of them hanging out together and going on a journey. Jason: You don’t have to get defensive! You said I’m not here for it, but I actually do have a soft spot in my heart for Kingdom Hearts III... The one thing I’ve grown less and less tolerance for is the dialogue. Just hearing the stuff they say out loud and how incomprehensible it is. Maddy: See I love it though, because that’s part of it to me, and I remember laughing out loud but like in a joyful way to the first two Kingdom Hearts games, possibly because I played it with another person, and we would quote lines at each other, like Axel’s stupid ‘Got it memorized?’ thing. All the -isms that each of the characters say to one another in these games, they always have such a weird intonation. It just becomes something you can quote with your friends. So having that be a continuation feels so incredibly weird in 2019, because it’s like, this is the sequel that should’ve come out in 2007 or something, and yet here it is, significantly later than that, except it’s exactly the same thematic content somehow. It’s as if somebody locked all the people making Kingdom Hearts III in a room for the past decade. They know iPhones came out, so they threw that in, but nothing else about the world or the way it works has changed. It’s just sparklier and looks better. I find that fascinating and impressive in its own right.